The script for this league cup semi-final could’ve been written for the Roy of the Rovers comic, albeit the underground version with fighting and swearing, rather than the more traditional one with the speech bubbles coming out of the crowd saying Yessssssss and Come on Skelmersdale, you can do it, boys! The Skem keeper turned out to be the unlikely hero as he kicked the penalty that put them in the Final against Eastwood Town. This was after having a shouting match with Gateshead fans in the first half and a full-blown fight with one such fan in the second. As it wasn’t a player he mauled, he wasn’t booked by the ref. The police might want to book him, though! I’d never been to Skelmersdale before. I’d imagined it to be a quaint Lancashire village with a steep and twisting cobbled high street with the smell of fish & chips, lots of poky real ale houses, an unusually high preponderance of cheese shops and a jolly butcher stood outside his shop in a striped apron, shouting about his sausages. I was quite spectacularly wrong. My doubts about my idyllic Lancashire town first surfaced after posting a question on Tony’s non-league forum about the best Real Ale pub to visit in Skelmersdale. The first two replies (bizarrely,I thought) suggested going to other towns, with the third kind of explaining the first two replies in saying he believed Skelmersdale (or Skem as the locals call it) to be the biggest town in England without a real ale pub! Setting my sights lower I asked again, this time just for a pub anywhere near the ground – the one reply suggested the town of Parbold! I arrived in Skelmersdale off the M6 and then the M58. 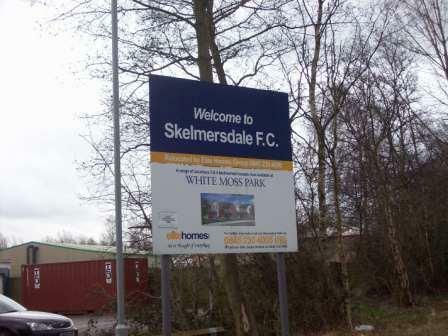 I only knew I was entering Skelmersdale because of a sign on the dual carriageway that said ‘Welcome to Skelmersdale’. The dual carriageways continued, interrupted regularly by award-winningly large roundabouts, one of which is known as the half-mile island, and has made a claim to be the biggest in the world. There didn’t seem to be anything else in Skem and I now understood the replies to my question on the forum. 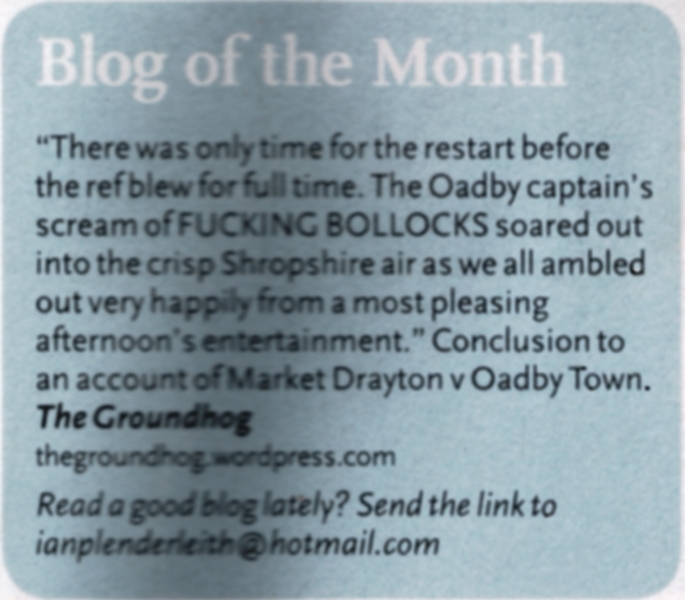 I got to the ground very early to meet one of the Godfathers of the football blog – Shaun Smith, of 100 Football Grounds Club fame. He is a Newcastle Utd fan but also follows Gateshead and was coming with the Heed Army. He texted me to tell me the supporters coach was running late, so I set off again, to find somewhere to get some painkillers for my headache and something to eat. After a few more roundabouts and dual carriageways I stumbled on an Asda. Even better, on the way back I saw a mobile burger fan at a roundabout, a much welcome oasis in a desert. The bacon and sausage butty was good, but standing there on a Saturday afternoon with no sign of life anywhere, it felt like I was in a film-noir depicting a dystopian vision of towns of the future. Doing a little research it turns out that Skelmersdale, while having a name recorded as far back as 1136 (as Skalmeresedel) and later becoming a small mining town, was designated a new town in 1961, designed to house the overspill from the Liverpool area. There is little evidence of the town it once was. 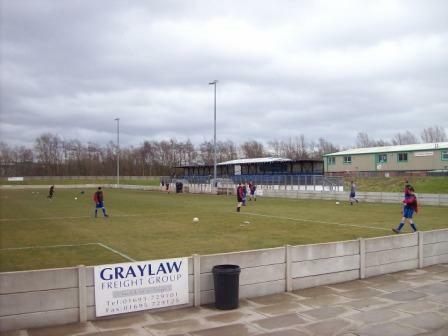 Skelmersdale Utd were founded in 1882 and were founder members of the Lancashire Combination. Their claim to fame was a trip to Wembley for the FA Amateur Cup final against Enfield which attracted the biggest Wembley crowd for a non-major trophy – 75,000. They drew 0-0 and lost the replay at Maine Road 3-0. 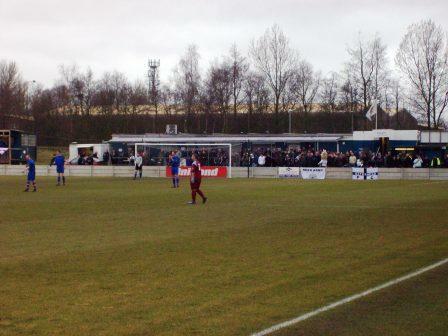 They have played in the Northern Premier in the 1970s but travel costs forced them to return to the Lancashire Combination, where they stayed until joining the North West Counties League in 1982. In recent seasons they have been making progress through the pyramid and now sit atop the Unibond Division One North (step 4), with a chance to gain promotion back to the Unibond Premier. 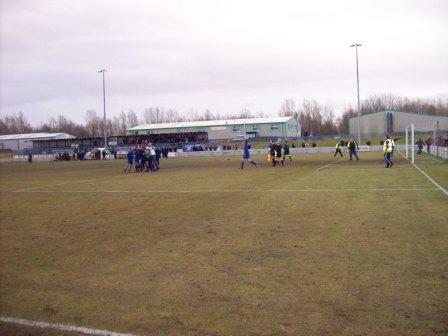 This is only their fourth season in their new ground, which was originally the Westgate Interactive Stadium. The Stadium lies down a lane, off one of the roundabouts on the ring road, in amongst a very low-density industrial estate, called Stanley. It has a big car park and a very big clubhouse / functions room with a bar and big screen TV. There is just one seated stand down the side, about a 250 seater, nice blue seats in four rows. It was elevated a fair bit and so you got a better than average view of the action. In front of the clubhouse is a small covered terrace, the perspex cover attached to the clubhouse. This bit of covering was very cosy when packed with heed fans in the pouring rain and proved to provide a good atmosphere. There was a large flat step of uncovered standing a bit further down. The other side and end were one step standing but with plenty of room for expansion if needed, and a nice touch was the steep banks that you could climb up for a better view. The game was a humdinger of a cup tie and was well worth the £7 entrance. I was an honorary Gateshead fan for the day, joining Shaun Smith and the ‘Heed Army’ for the day. They brought a fair number with them and I’d say comprised about half of the 259 crowd. It was a great atmosphere standing with them, and it seemed like it was a much bigger crowd. The first half was fairly subdued with Skem taking an early lead, a nice finish from a through ball down the middle exposed a sleepy defence. Gateshead came to life in the second and looked likely to score…which they did, from a firm cross and deft glancing header from Armstrong powering into the side of the net. During this half the Heed Army had moved to the other end, and were giving the Skem keeper stick, which is nothing unusual at football games. What was unusual was that the keeper started shouting back regularly, much to the amazement and, unfortunately for the keeper, delight of the hecklers. The game ended 1-1, which was a fair result as Skem had a few chances themselves later on, and both sides played good football. 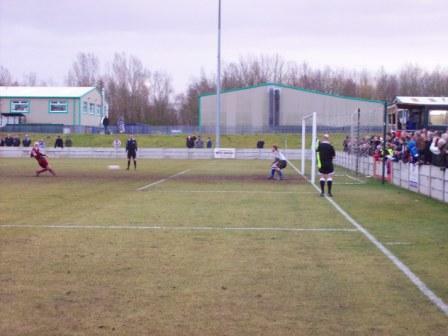 In extra-time Gateshead scored to make it 2-1 early on, a near tap-in from Harwood from a low cross. This is when action of a different sort began, as one Heed fan ran onto the pitch, presumably to gloat in front of Skem’s keeper, Ryan McMahon. McMahon took it badly, trying to contort the fan’s face into different positions with his arm round his neck. The argy bargy was separated and the fan removed from the ground, where he stood on the front of the coach with the doors open, still watching the game above the low ground surround! Skem equalised with a penalty in the second period of extra time, setting up perfectly the ironic ending, that Shaun predicted as soon as the equaliser went in – that McMahon would turn from zero to hero by stopping a few penalties and putting Skelmersdale in the final. The fact that he actually scored the winning penalty was unforeseen and rubbing it in a little for the Heed Army. This entry was posted in Travelog and tagged avant garde, film noir, roundabouts, skelmersdale. Bookmark the permalink. Great stuff David, always a good read. 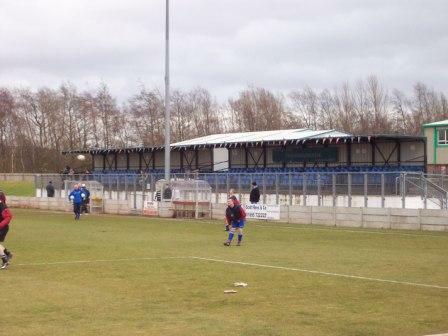 Seems like Skem have a really nice new ground unlike so many non-league clubs. Any idea where they got the money to get it built? Thanks Jeremy and Shaun. Shaun – I’d be honoured and may get to know your privates better! 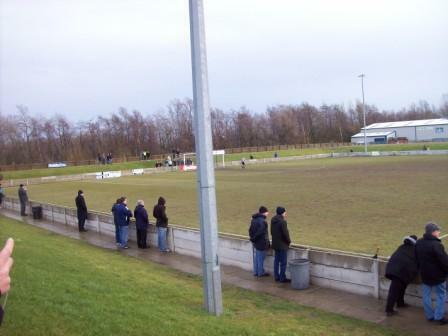 Jeremy – as for Skelmersdale’s ground and the money, it’s a good question. Probably a mixture of private investment and council funding and various footballing body grants. You’d be amazed at how much money there is floating around even at this level. My local club, Norton Utd, had £200,000 spent on improving their ground in the summer and they are two steps below Skelmersdale. They actually sold their old ground to a development company. It is a housing estate now,so i guess they must have sold the land for a few quid.